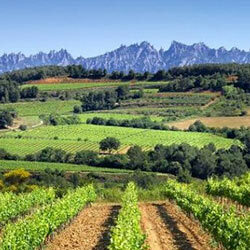 A very, very small DO in Catalonia (and even more so in greater Spain), Pla de Bages is often overlooked. With only 13 cellars in total, it’s understandable as it’s not a heavy hitter in terms of overall wine production. But, located quite close to Barcelona but with a continental climate, it can make an easy visit for those who want to do a one day trip out to one of the wine regions. After the plague of phylloxera passed through, there was little to no production for nearly a century and all the wineries that exist are relatively new projects with Abadal being one of the more notable and vociferously active in terms of promoting their region. Oller del Mas is notable for having one of the very few Vins de Finca in their line of wines. The majority of their production is based upon Grenache and Tempranillo for the reds and then Picapoll, Macabeo, and Parellada for the whites. Naturally, foreign varieties have made their way in over the years including: Chardonnay, Cabernet Sauvignon, Merlot and Syrah. The rather rare grape local called Sumoll has grown a good deal in recent years as people work to recuperate what they believe to be native varieties. Please peruse more articles about the wines of Pla de Bages.